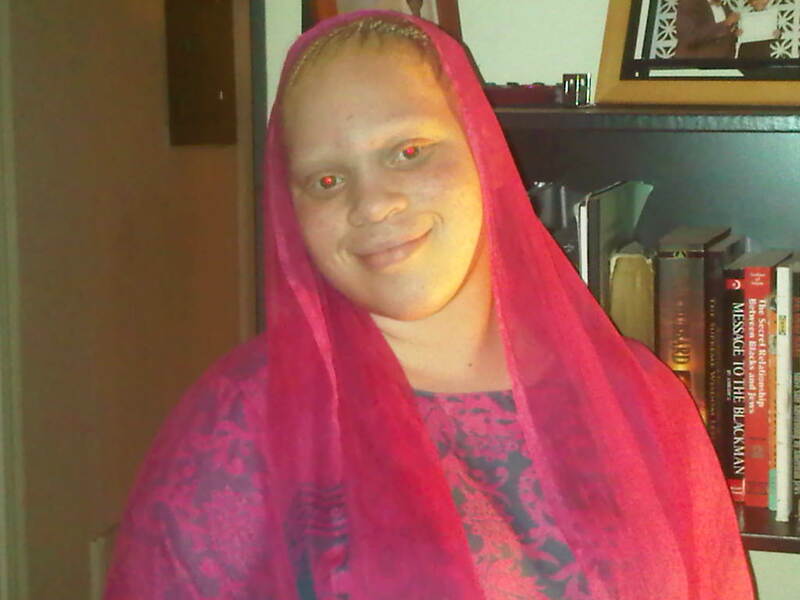 Qiyamah Muhammad is a 17-year-old girl with albinism. She lives in Washington, DC and attends Muhammad University of Islam. She started an organization called, Confident Albino Brothers and Sisters (C.A.B.S) to bring awareness to those living with albinism worldwide. Qiyamah is also interested in Korean pop culture, music and dramas/movies. She plans to travel to Korea one day. Qiyamah lives with her parents Anthony and Angela Muhammad and big brother Asad. When she was younger, she used to get the stares and questions. Some of the most common questions she used to get all the time were, “Are you black/white?” followed by “Are you sure?” And “Can you stop moving your eyes like that?” It used to bother her but because she has a strong support system with her family and the Nation of Islam who always instilled pride in not only her blackness but being proud of who she is in her albinism, she has confidence in herself. Because of that, people in her community and family have asked her to talk to their children living with albinism and battling low self-esteem. That inspired her to start a group called Confident Albino Brothers and Sisters. This is a group to help other albinos with self-esteem. Qiyamah’s goal is to be able to provide more information to people about albinism, she wants to go into schools and educate students, bring attention to the killing of albinos in other countries and provide necessary skin protection to albinos who live in safe houses in Africa. Why are you so passionate about Why Yes, I’m Albino Campaign? I’m passionate about our Why Yes, I’m Albino video campaign because it affects me personally. Recently, a very popular speaker was seen in a video using the word albino in a derogatory way. The word was used to make another person feel less than who he is and to mock the person’s looks. It was used to make fun and belittle someone else who was not albino, only light skinned. So I decided that I was going to take back the word “albino” and not give it any negative power over me. I prefer the word albino because that is what I grew up with along with saying I was black. I didn’t know of any other way to call myself. I am Qiyamah Muhammad. I am a student, a daughter, granddaughter, niece, a sister, a writer, a Muslim and why yes, I am albino. How did you come up with the idea of doing a video? Actually my mother’s best friend, Ms. Rona thought of the idea. We wanted to do something that would bring positive attention to the albino community and go viral, so she thought doing a video would be a good idea. When the incident about the derogatory use of the word albino happened, I thought it would be a good idea to have those in the albino community submit videos saying that we are albino and proud.